Milk jug is one thing everyone will throw it after it is used.But I got inspired by the idea shared by Natalie from Creme de la craft and tried my hands on that idea.Though I did not get it right the first time ,it was worth trying it for 2 or 3 times.Yes , It was a sandwich box which she made from milk jug.But I personally prefer it for storing my supplies rather than using it for sandwich.I made one for my brother which he is using for storing his shaving kit.As always there are lot many uses for this milk jug but now we will see how to make a box. Step 1:Mark the shape to cut as shown below.Mark the three semi circle flaps in such a way that they should overlap each other. Step 2: Using xacto knife make a hole as shown and use scissors to cut the remaining shape.The final shape should be as shown below. It should look like this after cutting. Step 3: Decorate the closing flap .I used duct tape to decorate closing flap as well as the small flaps as I didn't remove the stickers.If you don't want the stickers to be shown you can decorate it or remove stickers by soaking it in water before you start to cut.You can also use paint, mod podge & paper ,washi tape ,etc to decorate it. 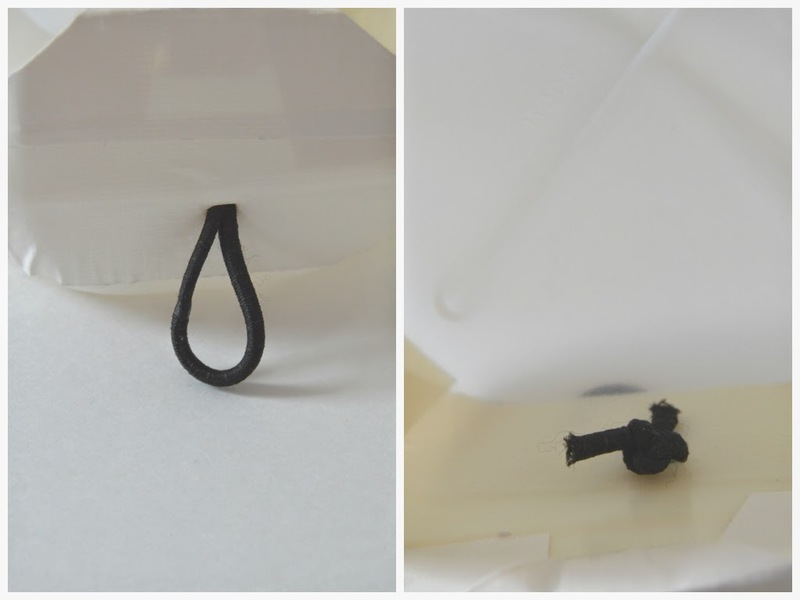 Step 4: After decorating ,now its time for attaching fasteners.,I am using a button and elastic to close the box. Make a hole and insert the elastic inside and tie a double knot to secure it.I used hair elastic as closure.If you don't have one you can get the normal elastic used for sewing. 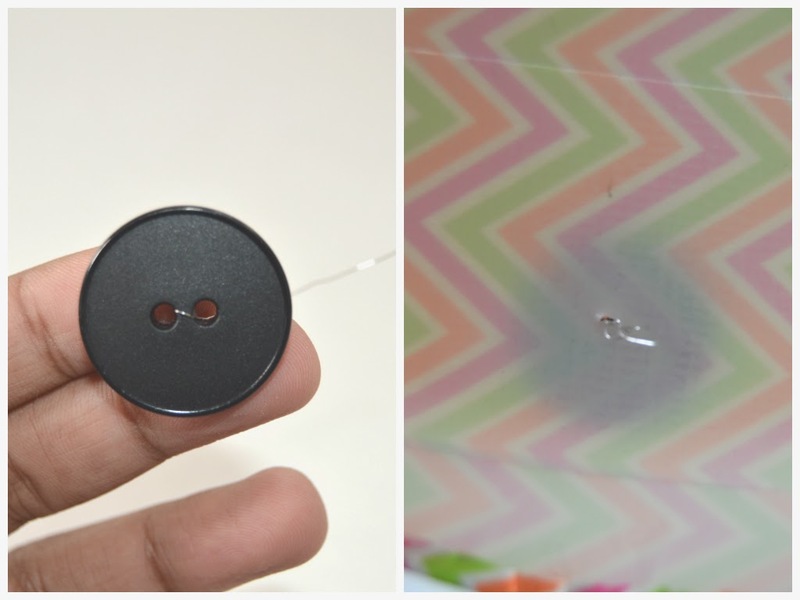 Step 5: Use needle and thread to attach the button in the closing flap or make a small hole with a knife and insert the button using a piece of wire and twist the wire after inserting to prevent it from falling and secure it with the tape.Yay!!! you are done.You can now use your beautiful decorated box for storing your supplies.I am using it for storing my craft supplies.What will you use it for ?? Step 1: Cut you milk jug all around below the handle by using xacto knife and scissors. Step 2: Cover them with duct tape and decorate it with some stickers.As said before you can also use paint,washi tape,mod podge and paper,etc to decorate it. Easter is approaching and this is one of the best way to make a Easter Basket under budget :).Oh yes ! !Forgot to mention.It passed the weight test.I tested with 15 bottles of paint (As shown). Hope you enjoyed this post.Feel free to share your comments below or write to vikalpah@gmail.com for any clarifications .I will be happy to hear from you. Very cool! 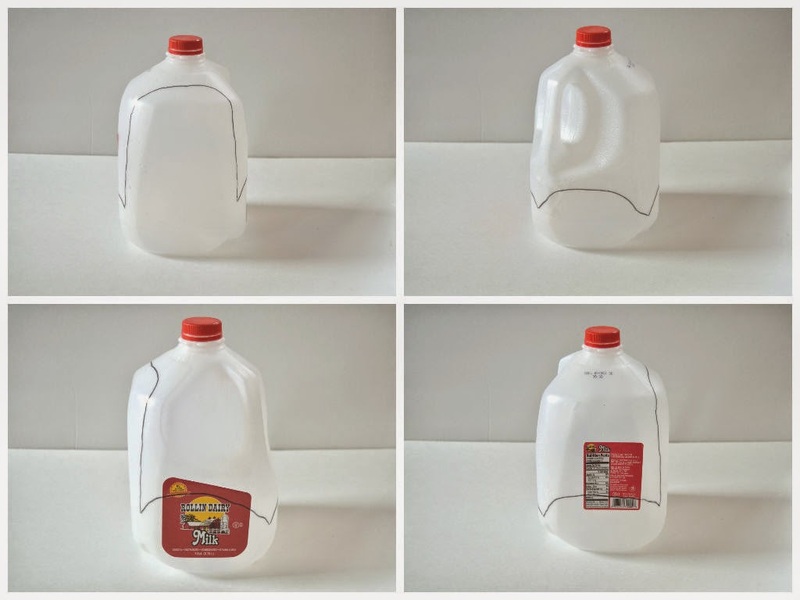 We all have milk jugs that are better off being re-purposed than thrown in the trash! 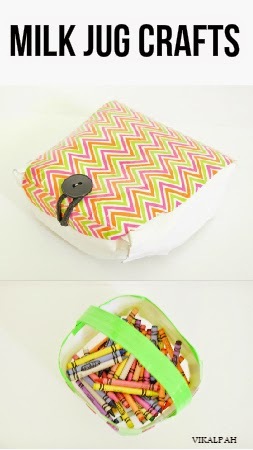 Love these ideas and what a great way to use something we all just normally throw away! What a great idea! I've never seen such a thing. I love the idea of having it to organize supplies. My kids would love to have their own basket of supplies, or just a basket to tote around their toys here and there. I saw this 'sandwich' container in a magazine, All You ? not sure.. but never understood how they made it.. Love your instructions! I especially love how you decorated your repurposed containers! Super cute and creative! Another 5 stars!!! These are so cute! I can imagine a whole classroom of these containers! Wow! Not something I would have thought of. Thanks for sharing!! Great idea for a milk jug!! Very unique! Thank you for sharing! I love the basket. Pinned to my recycle/reuse board. How clever! I love the basket idea, it's awesome. Thanks for linking up to the Craft Challenge. Super cute idea and great way to recycle old milk jugs! This is very creative and adorable. Great ideas! love the idea of adding a flap - keeps your secret treasures safe and secure!